Left to right, Anders Yates, Danny Pagett, and Alex Paxton-Beesley in Slip. Photo by Alec Toller. The past month was busy for theatre in Toronto, with the Next Stage Festival, the Progress Festival, and plenty of both independent and commercial shows running. Last week, we made time for two shows off the beaten track, in format if not in space; a devious and clever murder mystery called Slip, and One Night Only, a musical with no script or score—because it’s being created and performed in real time by actor-singers. Circlesnake Productions creates its shows collectively from the ground up, usually with an existing genre or property as a jumping off point. Past shows have included the “Heart of Darkness in space” Dark Matter, and the transit cop caper Special Constables. Slip, their latest effort, designed specifically for the close quarters of The Box’s studio space, is a subtle send-up of television procedurals with a touch of comedy like Bones and Castle, right down to the focus on a brilliant but bickering detective duo, here played by Alex Paxton-Beesley and Danny Pagett. 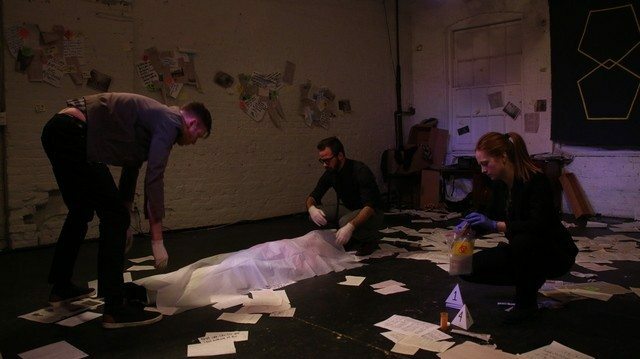 “Tell me a story”, the partners constantly challenge each other, as they examine their latest crime scene, making intuitive leaps as they construct alternate scenarios to explain the mysterious death of a young woman (an affecting Mikaela Dyke) in a shabby studio apartment. Anders Yates and Paloma Nunez, both performers who cross back and forth between Toronto’s comedy and theatre scenes, round out the cast as a series of supporting characters, but it’s Pagett’s Mark and Paxton-Beesley’s Lynne who remain the focus as the case begins to take an unexpected toll on their work and personal lives. Both detectives are addicted to narrative, gambling with each other over who can piece together the more compelling and airtight hypothesis. They also have issues, on and off the job, that threaten not just their work and relationship, but their ability to keep their stories spinning, like plates. The actors have sharp comedic timing and a strong chemistry, but it’s Paxton-Beesley, returning to the stage after seven years of focus on Canadian film and television, who’s the lynch pin of the show, as a tightly wound and competitive workaholic who can’t clear this particular case. The cast of One Night Only. Photo by Robyn Bacon. Circlesnake isn’t the only collaborative collective with a show currently running. The cast and creative team of One Night Only: The Greatest Musical Never Written take it several unusual steps further, by creating a brand new musical every night of their current run. The cast, all experienced improvisers as well as singers, have a choreographed and scored introductory number, but everything after that—the story, the songs, the music, lights, and setting—is made up on the spot based on suggestions from the audience. 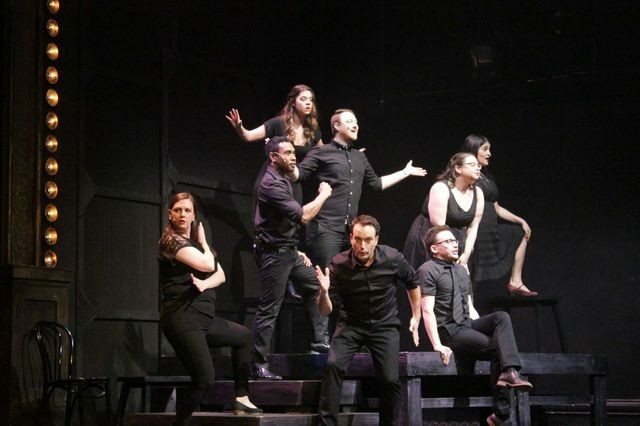 It’ll strain credulity for most attendees that the cast—most of whom are Second City alumni—really are composing lyrics and rhymes instantaneously; after all, most musicals take years of tinkering and development, getting all the elements just so. But artistic producer Alan Kliffer has been workshopping the format for a long while with one-offs and monthlies, and now has an all-star cast, an ace comedic director (Melody Johnson), and a five-piece band on stage for this substantial run. That spark of spontaneous creation is what they’re all chasing, with the added layer of musical accompaniment and rhyme structures. The night we attended (a preview where one band member was absent, and the show was still working out some technical kinks), the story took place at a series of airports, and featured a bickering older couple (Ron Pederson and Jan Caruana), a middle-aged pilot (Reid Janisse) and acrophobic (Carly Heffernan) falling for each other, and two roguish baggage handlers (Ashley Botting and Alex Tindal). Along with the live accompanists, improviser-singers Kevin Vidal and Miriam Drysdale contribute chorus vocals to the larger numbers. At One Night Only, you may have trouble believing it’s all happening right in front of you; seeing Slip, you may come to doubt the narrative of the show’s increasingly unreliable storytellers. But in both cases, if you shelve your sense of disbelief, you’ll come to realize those aren’t important to enjoy either show. Both churn along on impressive imagination, the musical improvisers crafting songs that reference things that couldn’t have been planned (but wouldn’t be less entertaining if they were), and Slip‘s detectives, trying to one-up each other with increasingly implausible stories that may be landing closer and closer to the disturbing truth. Either way, you’ll watch something you won’t see on Netflix.